Unfortunately, hurricanes have already caused damage to the United States this year. Hurricanes have caused significant wind damage to people’s homes and businesses. Now is the time to protect your home from the damage that hurricanes can cause. Hurricane Safe Products offers a variety of hurricane protection products that are designed to keep your home safer when storms strike. In the Sarasota area, high winds can be a problem during storms. Impact windows and hurricane screens can protect your home from the impact of flying debris. Hurricane Safe Products has hurricane protection solutions for both homes and businesses. Contact Hurricane Safe Products, and learn more about the wide variety of protection solutions that are available. Prepare for tomorrow’s hurricanes today. The lesson of Hurricane Irma is clear: Hurricane preparedness isn’t something Florida residents can afford to put off until tomorrow. By the time it becomes clear that a hurricane is imminent, it may be too late to take steps to protect your home from it. The results can be devastating. Hurricane Irma left 134 dead and thousands of others without homes. Don’t take that risk. By taking the time right now to prepare for the unexpected, you can save yourself from unnecessary stress and expense. Make sure your hurricane protection plan is in place today. Visit www.hurricanesafeproducts.com for hurricane screens and windows, Lexan panels, and other products that can protect your home and property from hurricane damage. Give yourself the peace of mind of a home that’s ready for anything that comes it’s way. On September 10, 2017, Hurricane Irma made landfall in Florida. The state was devastated; 134 people lost their lives and a rough estimate of 10,000 others were left without homes. Entire properties were swept away, submerged in water, or damaged beyond livability. While Florida residents are faced with the risk of encountering this natural disaster every hurricane season, preventative measures may help reduce the risk of damage and threat to safety another storm like Irma would present. Every hurricane protection plan should involve hurricane safe products to reinforce a home during hurricane conditions. The first features of a home to become damaged are often windows, doors, or garage doors. High wind speeds may even unhinge or completely detach these features, further compromising the rest of the home and the safety of its occupants. Hurricane screens, garage door braces, ultra shade screens, hurricane windows, and more hurricane safe products serve to prevent unnecessary damage. To take the first step in preparing your home for hurricane season, visit www.hurricanesafeproducts.com. What Should Florida Residents Pack in Their Hurricane Supply Kits? Hurricane season can be one of the most stressful times for Florida residents, but hurricane preparation can be the most important step in proper hurricane protection! While it is important to ensure you have the proper resources to protect your house, it is essential you have a supply kit in your home in case of emergency. It is crucial to have enough bottled water. This is important to ensure you are hydrated in the event the power goes out, but it is not uncommon for hurricanes to cause issues with drains and plumbing. Ensure you have enough nonperishable food items. Although it seems standard to stock up on snacks like granola bars, try your best to have canned food items or more filling food options. Hurricanes bring strong winds, and those winds often bring power outages. Make sure your hurricane supply kit includes multiple flashlights as well as batteries for replacement. We recommend having at least one flashlight for each family member. In case of injury, include a fully stocked first aid kit in your hurricane supply kit. The best hurricane protection starts at home. Do not wait until the last minute to prepare for the storms. The summer and fall seasons tend to be the more splendid and visually appealing times of the year. Perhaps winter fills a certain niche market, but the consensus across the board is that warmth is great. The opportunity for diversion and livelihood are abound, and with school out, these two seasons are rich with chances to make memories. Unfortunately, these tepid months also comprise the yearly period of wariness known as Hurricane Season. This is a season of worry and precaution, as tropical storms can morph their way into the titanic weather pattern of yore that has flooded streets and put entire cities under water. It is important to stress the importance of hurricane safe products around the house and work space. Thankfully, an aptly named company has emerged as one of the forerunners of safety products for all purposes. Hurricane Safe Products offers nothing but top of the line inventory for the homeowner that would prefer to err on the side of caution rather than risk it all and lay bare before the elements. Hurricane Safe Products employed a time-tested formula of customer interaction that leaves a smile on all the faces of each potential customer that walks in. Florida Residents: Is Your Hurricane Protection Enough For Hurricane Season? Residents of Florida know the annual challenges that come with hurricane season. Multiple hurricanes per year hit the state, but their severity varies wildly. Still, a mild hurricane is no laughing matter and can cause thousands of dollars in property damage. Hurricane protection is necessary for every home in Florida. Even basic protections like rolling shutters and hurricane screens can make a difference. Every resident in Florida needs to take basic precautions here. Otherwise, a hurricane, or even a minor tropical storm, could damage a home in minutes. Installing these hurricane protection solutions is simple and straightforward. When the materials come from a trusted provider, then homeowners have nothing to worry about. A given homeowner needs to start protecting their property from hurricanes long before hurricane season starts. For the best results, it’s important to install protections against hurricanes and storms months in advance. Homeowners can then proceed with the peace of mind that their property is protected from these storms. Nothing is worse than installing thes protective measures as a large hurricane is barrelling toward Florida. Anyone that lives in Florida should take hurricane seriously each and every year. Installing the proper damage prevention measures right now is the best course of action. By the time hurricanes hit the state, a home can be protected and prepared for the years to come. Hurricane shutters offer significant hurricane protection during a storm, but that isn’t all that hurricane shutters are useful for. Hurricane shutters help to keep your home secure while you are away. This is especially important for those residents who are away from their Florida residence during the summer months. Rolling shutters from Hurricane Safe Products pull down securely over openings. They have a special locking system that keeps them secure. They can’t be removed from the outside of the home, so thieves are prevented from getting in. 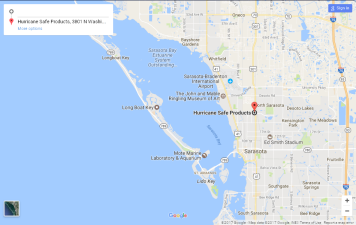 Hurricane Safe Products proudly serves those in the Sarasota and Bradenton areas. In addition to hurricane shutters, there are a wide range of hurricane protection products available including hurricane screens, impact windows and clear protection panels. Contact Hurricane Safe Products for your hurricane protection and home safety needs.